My air-conditioner pooped out a couple weeks ago. Of course that was the week of temps in the 90s and humidity of approximately 150%. So until the service person was able to attend to (luckily) only a minor repair, I had to fall back on meals that didn't require much cooking. 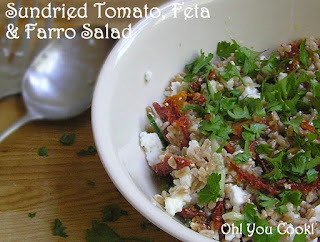 Luckily I saved a copy of this salad from Mele Cotte, one of my favorite bloggers. The original salad used barley, but I had about a cup of farro remaining in the pantry, practically begging me to use it. Since it was too hot to argue, I acquieced. The only heat was getting the broth to boil, and I did that in the microwave to avoid melting the kitchen any more than necessary. The black olives are missing from the photos because I couldn't find that can of olives hiding in the back of the pantry. Until after lunch. Of course.